Solar wind flowing from the indicated coronal holes should reach Earth on or about Feb. 13th. Credit: SDO/AIA. "The storm is very bright," says Go. "I spent a few minutes observing it visually (through the eyepiece) and it is very prominent." 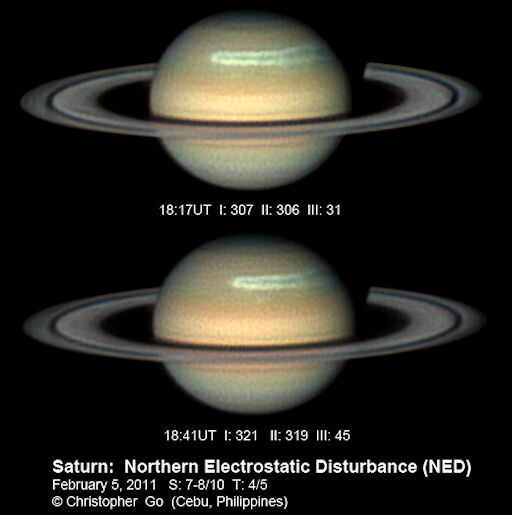 Researchers call the storm the "northern electrostatic disturbance" because (1) it is in Saturn's northern hemisphere and (2) it is strongly charged with lightning. Receivers onboard NASA's Cassini spacecraft are picking up radio crackles each time a bolt discharges--much like the static you hear on a car radio when driving through an electrical storm on Earth. The storm is stretching around much of Saturn's northern hemisphere--and growing longer. This means there a good chance of catching it no matter when you look. Amateur astronomers are encouraged to monitor developments. Saturn may be found high in the southern sky before dawn shining like a yellow 1st-magnitude star. "I didn't know Hubble could do this," says M. Raşid Tuğral of Antalya, Turkey, who took the picture on Feb. 7th. "The HST suddenly flared to magnitude -2, almost as bright as the planet Jupiter." This is the kind of streak you could see even from brightly-lit cities; in the remote Turkish countryside, "it was dazzling." Although not widely publicized, Hubble flares have been observed for years by members of the satellite-watching community. The luminous outbursts are caused by sunlight glinting from one of the spacecraft's flat surfaces--possibly the telescope's aperture door or its "aft skirt." Predicting Hubble flares is tricky because they depend sensitively on the telescope's observing schedule. Slewing from one galaxy to another, stopping for calibration, detouring to a newly-reported supernova: any of these actions could produce--or forestall--an absolute shadow-caster. The only way to see a Hubble flare is to take a chance on looking. Let your cell phone be your guide. 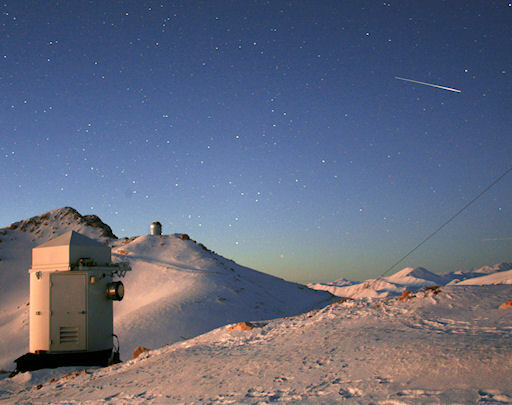 On February 8, 2011 there were 1195 potentially hazardous asteroids.